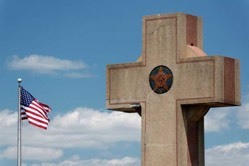 The 4th Circuit Court of Appeals on Thursday refused to revisit an October decision that declared the 90-year-old "Peace Cross" was unconstitutional because it rests on public property. The monument is a memorial to the 49 men from Prince George's County, Maryland who died fighting for liberty in World War I. The memorial, paid for by the American Legion and local citizens, consists of a large Celtic cross on a pedestal inscribed with the words "Valor," "Endurance," "Courage," and "Devotion." "Government war memorials should respect all veterans, not just those from one religious group," AHA attorney Monica Miller said. "The cross unconstitutionally endorses Christianity and favors Christian soldiers to exclusion of all others." You need to understand the American Humanist Association's ultimate goal-they want to eradicate any public mention of Christianity. They want to destroy the Judeo-Christian values and teachings that flavor every one of our founding documents. They have declared war on Christians in America and they will not stop until God and Jesus and the Bible are scrubbed from the public marketplace. Federal Judge Paul Niemeyer warned people of faith that the Bladensburg ruling could lead to the unthinkable-the removal of memorial crosses at Arlington National Cemetery. "It ... puts at risk hundreds of monuments with similar symbols standing on public grounds across the country, such as those in nearby Arlington National Cemetery, where crosses of comparable size stand in commemoration of fallen soldiers," Judge Niemeyer wrote in his chilling dissent. First Liberty Institute and Jones Day, the law firms, representing the American Legion, vowed to appeal to the Supreme Court. And they should.